In recent years, the backup software industry has been going through something of a renaissance. Backup applications that had long been regarded as utilitarian and relatively static have become far more useful and feature rich than they have ever been before. It has been really exciting to see all of the innovation that has been taking place. Needless to say, I jumped at the opportunity to review version 7.6 of Altaro’s VM Backup. Before I get into the review, I want to quickly mention that although Altaro VM Backup gives you the option of backing up both Hyper-V and VMware hosts, I am basing my review solely on the software’s support for Hyper-V. I began my review by downloading a copy of VM Backup from the Altaro Website. The download consisted of a 211 MB executable file. The installation process made use of a standard installation wizard, and I found installing the software to be completely effortless. Once the installation process completed, I was taken into the Altaro Management Console, and asked whether I wanted to connect to an Altaro VM Backup Instance running on this machine or a remote machine. I picked the This Machine option, clicked Connect, and was taken into the backup instance, where I was prompted to complete a quick setup. Although attaching a management console to a software instance seems like a really simple thing to do, I have reviewed a number of products over the years that initially failed to connect, required me to look up a default password, or required me to change a setting before connecting. 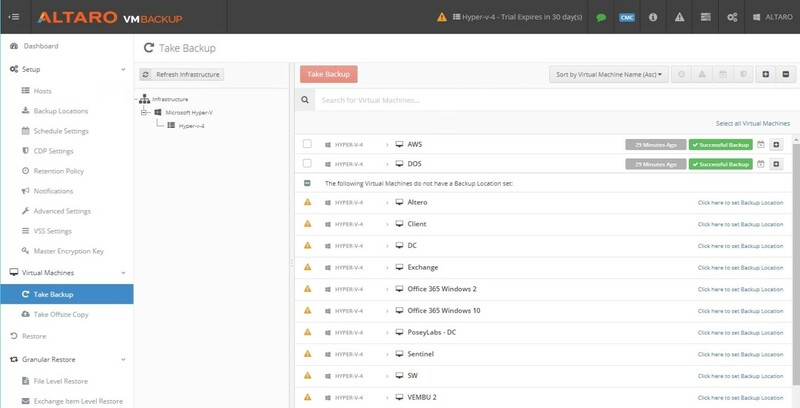 However, Altaro VM Backup’s management console connected instantly, and without question, on the first try. That’s how software is supposed to work. 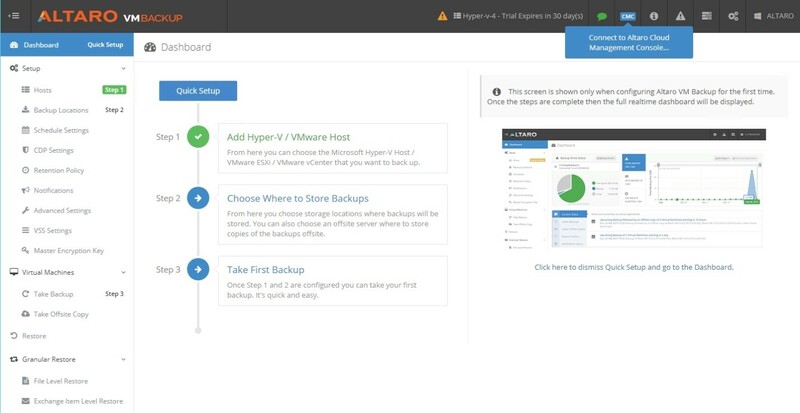 In case you are wondering, the Quick Setup consisted of three steps – adding the virtualization host to backup, choosing where to store backups, and creating the first backup, as shown in the figure below. The Quick Setup is a three-step process. I don’t want to spend too much time talking about the setup process, because there are other things that I want to get to, but I will say that the setup process worked flawlessly. More importantly, I appreciate the fact that Altaro included a mechanism for testing host connectivity during the setup process, rather than making me wait until I try to run a backup to find out whether or not I set everything up correctly. As previously mentioned, the third step in the Quick Setup process is to actually create a backup. I could have easily backed up all of the VMs on my Hyper-V host, but I thought that it would be more interesting to see if the software would allow me to backup some specific VMs, while ignoring others. Not only did the software allow me to do this, but it gave me a very clear indication that the backups had completed successfully, as shown below. My initial backup completed without issue. With the first backup out of the way, I decided to try scheduling some future backups. Scheduling works as advertised, but takes a bit of getting used to. 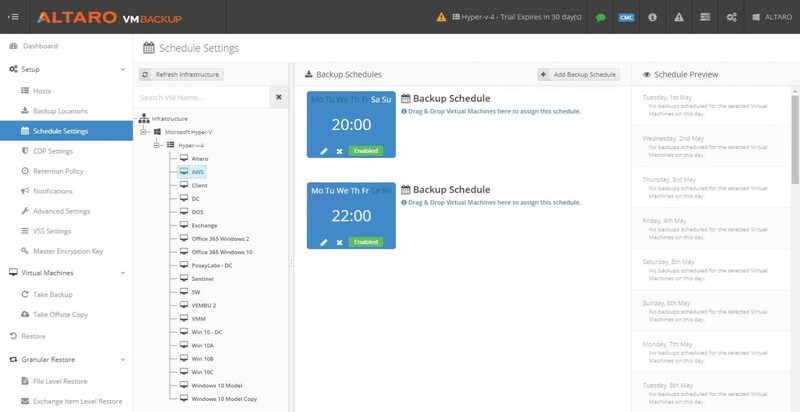 As you can see in the figure below, the interface allows you to set up a backup schedule, which it then displays as a large icon. You can link a VM to the schedule by dragging and dropping the VM onto the schedule. This is what the scheduling interface looks like. If you prefer instead to use Continuous Data Protection rather than a set schedule, there is a separate node for that in the console tree. As you can see what this interface looks like in the figure below. 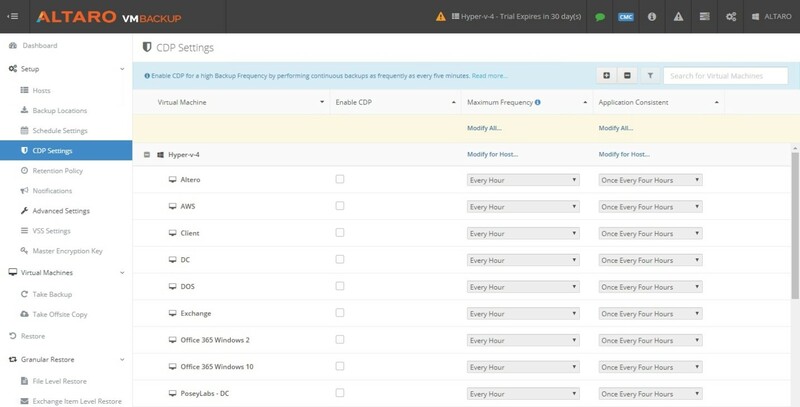 The thing that I like about this is that you can set the CDP frequencies at the host level, or at the VM level. This means that you can protect your VMs according to each VM’s own unique needs. Altaro VM Backup can provide continuous data protection. Of course, the best backup capabilities in the world are meaningless if you can’t restore your data. Altaro VM Backup allows for file level, Exchange item level, and virtual disk recovery. In each case, the interface walks you through the restoration operation in a completely intuitive, step by step manner. 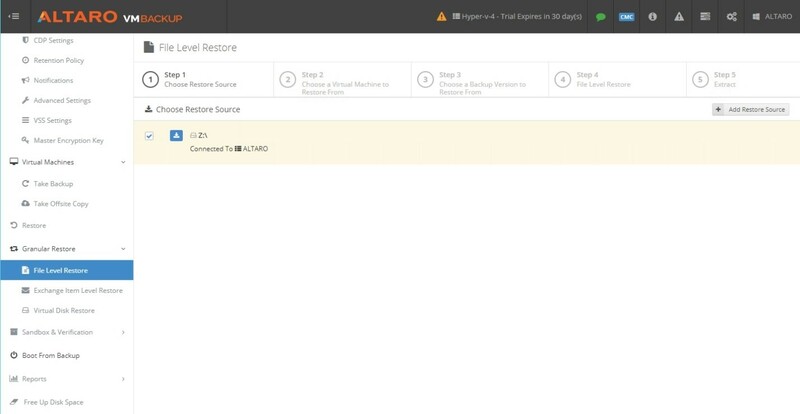 For instance, in the figure below you can see that step 1 is to choose the restore source, step 2 is to choose the VM to restore from, and so on. Restore operations follow a simple, step by step process. As you would probably expect, Altaro VM Backup contains lots of new features. Perhaps the most significant of the new features is something that I have already touched on a bit, the ability to transition from a “nightly backup” architecture to a continuous data protection (CDP) architecture. This allows for RPO’s to be shortened to as little as five minutes. It is worth noting, however, that this capability is currently available only for Hyper-V. In addition, Altaro has improved VM Backup by allowing concurrent backup operations on a virtual machine. This capability is especially important for organizations that are gradually transitioning to the cloud, or that are using cloud based data protection, because it means that backup operations do not have to be suspended while an offsite copy is being created. Altaro has enabled concurrency for retention, restore, backup, and offsite copy operations. 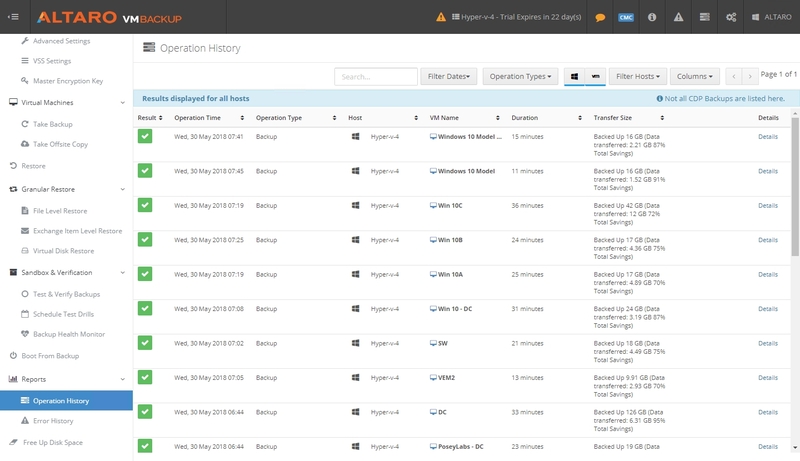 Altaro has also introduced numerous other capabilities, such as instant recovery (which Altaro calls Boot From Backup), the ability to backup to Azure, and inline deduplication capabilities, just to name a few. You can find the full list of new features here. Since Altaro lists deduplication among its new features, I decided to see how much space deduplication and compression could reduce a backup’s storage consumption. In doing so, I created a backup of thirteen random virtual machines. When the process was completed, the Altaro VM Backup dashboard revealed that the deduplication and compression engine had reduced my backup’s footprint by 86%, as shown in the figure below. The backup footprint has been reduced by 86%. The console’s Operation History report breaks down the space savings on a per VM basis. For example, the figure below shows that the first VM on the list contains 16 GB of data, but only required 2.21 GB of space to back up, which is roughly an 87% reduction is the physical size of the data. The operation history report shows the space savings on a per VM basis. As I worked through the review process, everything worked just the way that it should. As such, I didn’t end up having to contact Altaro’s support department. I therefore do not have any personal support experiences that I can share with you. What I can tell you, though, is that Altaro’s Website makes it known that the company takes great pride in the level of support that it provides to customers. According to the company, Altaro Support has a 99% satisfaction rating. The company also cites a 22 second phone response, a 16 second live chat response, and a 1 hour email response. 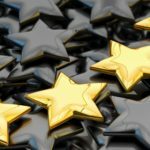 When I write a review for this site, I always wrap things up by giving the product a star rating, ranging between zero and five stars, with five stars being the highest possible score. In the case of Altaro VM Backup, I gave the product a score of 4.9, which is a gold star rating. While the product itself seems to be solid, the main thing that contributed to Altaro VM Backup receiving such a high score was its interface. In a world that is filled with overly complex backup applications, it is nice to find one that is so intuitive. More importantly, I really like the extras that Altaro worked into the interface as a way of making life just a little bit easier on its customers. I’m talking about things like the aforementioned connectivity test, a utility for freeing up disk space, and the ability to add restoration sources on the fly. If you would like to download a copy of Altaro VM Backup, you can get a free 30 day trial. 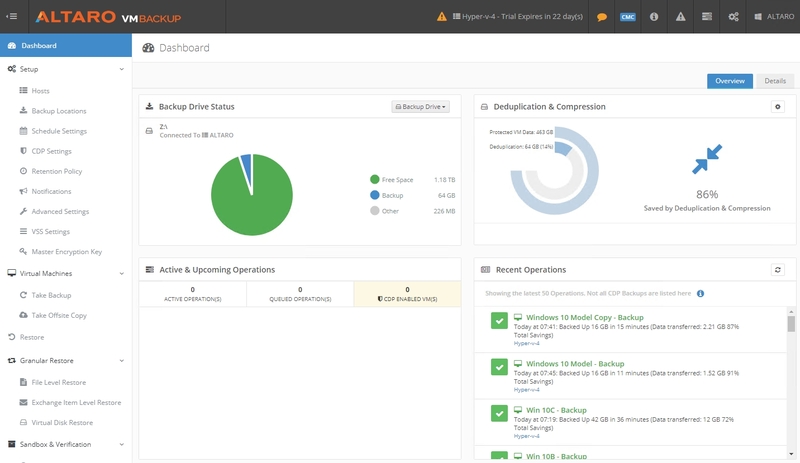 At the end of the trial, you can continue to use the software for free to protect up to two VMs per host. If you do opt to license the software at the end of the trial, the license cost ranges from $515 per host to $875 per host depending on the edition that you choose. This price gets you a perpetual use license, which is something that I wish more software vendors would offer, and it includes a year of free priority support and updates. Learn more about Altaro VM Backup or download the free trial.